Transactional emails are one-to-one unique messages that the recipient is expecting to receive. They are usually triggered by the user and do not require an unsubscribe link. While transactional emails can help fulfill marketing needs by recovering abandoned carts or re-activating inactive users, these emails are primarily functional and provide an anticipated response to an action or a request made by the recipient. Unlike promotional emails which are bulk distributions of the same content to many recipients simultaneously, transactional emails are personalized and typically sent to individuals one at a time. What are the types of transactional email? Welcome emails, password resets, and receipts are all examples of transactional email. Password reset emails are one of the most common types of transactional email. Pretty much every application that allows user to create an account will send them at some point. Ensure your password reset emails are delivered to the inbox quickly so users are never left waiting around. Easily set up DMARC to protect your users against phishing scams that aim to steal their passwords. Postmark’s template feature makes it easy to build and manage an email template for your password reset emails. Create great password reset emails for your app. All those receipts, order confirmations, and invoices you receive from buying products and services online are examples of transactional email. Postmark’s high delivery rates ensure your invoices reach the inbox. Insight into whether a customer opened your invoice using Postmark’s 45 day activity history. Bounce webhooks can automatically notify your support team if an invoice email bounces so you can follow up with the customer. Create great receipt and invoice emails for your app. Transactional emails can also be triggered by a users inaction. For example, you might send a customer an email to let them know their free trial of your product is about to expire and it’s time for them to upgrade to a paid plan. Open and link tracking allows you to evaluate whether your trial expiration emails are effective at getting customers to upgrade. Postmark’s templates feature makes it easy to build and manage your trial expiration emails. 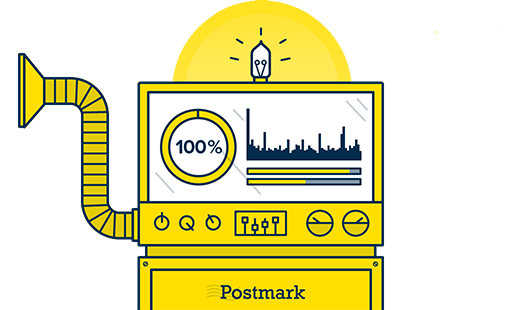 Take advantage of Postmark’s great deliverability to ensure your emails reach the inbox. Create great trial expiration emails for your app. Emails sent by an application to invite a user to create an account or join a team are also transactional. They are usually triggered by a user action, contain a unique invite link, and are expected by the recipient. Ensure invites reach your users’ inboxes quickly. Open and link tracking allows you to identify users that opened an invite email but didn’t create an account. Use Postmark templates to easily build and manage your invite emails. Create great user invitation emails for your app. Notifications are a key part of many web applications. Whether you need to notify users about order updates for an e-commerce site, or comments on a social network, notification emails are a crucial communication channel with your users. Postmark ensures your notification emails reach the inbox quickly so users can act on them right away. Use Postmark’s open and link tracking to measure engagement with your notification emails. Notify your application when a user opens a notification email using webhooks, so you can mark that notification as read in your app. Create great notification emails for your app. The welcome email is a key part of a users first experience with your app. Ensuring this email reaches a users inbox in a timely manner is critical to making a good first impression. Postmark’s fast delivery ensures your welcome emails reach the inbox quickly. Link tracking helps you identify which resources highlighted in your welcome emails are most popular with users. Postmark Rebound prompts users to update their email address from within your app if the welcome email you sent them bounced. Create great welcome emails for your app. Why choose Postmark for your transactional email?